Payments may be made by using PayPal or a credit card. I accept Visa/Master Card, American Express and Discover. I ship via Priority Mail with the USPS. Shipping within the US is $15.00 and includes insurance. Refunds will be given if you are not completely happy with your purchase minus the shipping expense. You must contact me within 5 days of receipt and ship the bear back promptly in the original condition using the original packaging. 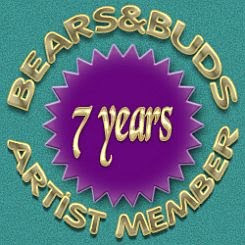 Please note: The bears on this site are intended for adult collectors only. They are not suitable for children.